10 to 13 year old boys and girls. A quality vacation camp experience that helps campers to develop confidence in public speaking during fun activities that include basic outdoor survival skills, pottery craft, jewelery craft, environmental awareness and hiking. We purposely keep our camp size small (20 - 25campers), to allow for quality care and attention. Victor among students during a field trip for a primary school. Victor has worked with vacation camps for over 10 years, providing a range of outdoor activities from boating, hiking, adventure races, team building, cave exploration, fishing tours and environmental awareness. He is the recipient of the latest BTA Award of Excellence (2009) in Attractions & Activities, a certified Tourist Guide Trainer, and a certified Standard Hike Leader. 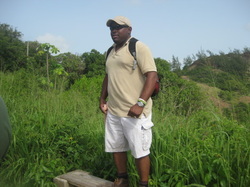 Victor is also a volunteer hike leader with the Barbados National Trust, and a member of the Barbados Museum & Historical Society. Victor is the husband of Director Melva Cooke. Melva, with nephew Darian in this photo, is our resident photographer (except for this shot), who is steeped and is Barbados Community College certified in the creative arts - jewelery, fashion design to name a few. 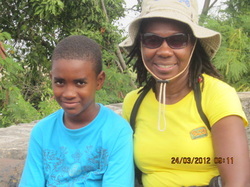 Melva functions as an excellent sweeper on Eco Adventures' hiking & walking tours ensuring that no one is left behind. As an enthusiastic and trained Sunday School teacher, she teaches teenagers with Victor her husband. Melva is a Canadian certified care giver who really puts this skill and training to use on our outdoor events. Master Potter John Springer at his potter's wheel demonstrating his expert craftsmanship. 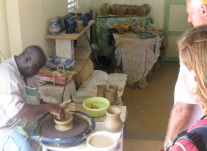 John is from a long line of Potters going back 200 years; he also teaches this intriguing art form. Tamisha Cummins, John's assistant specializes in the slab technique and campers will be exposed to both forms. Troy, an energized man of many talents has attained the level of Chief Scout, Barbados Boy Scouts Association, is well versed in the art of outdoor survival. He will assist campers in developing outdoor cooking skills, trap setting, and shelter construction. Troy has provided tutoring services to Barbados Community College Graphic Arts students, and in addition to his professional graphics designer skills he is a Marketing Consultant.